Given the population size and the distribution of income, the two questions that arise in a person's mind are: what is the mean income and how unequally is the total income distributed among the individuals in the society? Loosely speaking, income inequality represents interpersonal income differences within a given population. Income inequality has become a growing concern for the policymakers because it has important effects on development, poverty, social outcomes, and public finance. In terms of social outcomes, inequality has impacts on several issues, including, health, education, incidence of crime, and violence (Deaton, 2001). 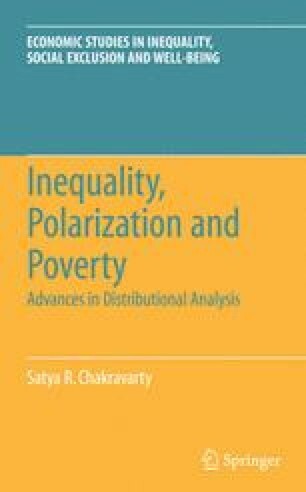 The levels and heterogeneity of local inequality may affect tax collection and influence the decentralization of provision of public goods (Bardhan and Mookerjee, 2006). For a given mean income, high inequality generally implies high poverty. Development studies and public finance often employ indicators of inequality to evaluate a distribution of income or the distributional effects of a particular economic policy. Some of the standard questions that arise in this context are: (1) Is inequality in the country lower now than it was in the past? (2) Does region I of the country have more inequality than region II? (3) How much of total inequality arises because of variations of the mean incomes in different regions of the country?